And so I went to my garden and pushed the soil around. It wasn’t a frozen mass of soil, and it was slimy mud. It was soil!! 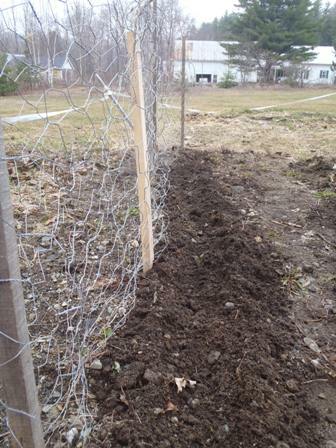 That means it is time to plant peas (and beets, kale, and spinach). It is way to early to plant too much else around here, we are still going to get lots of frosts between now and the end of May. Check it out, I was lucky enough to be nominated by BDD to be featured on Jason‘s (CookTrainEatRace) weekly Athlete’s Plate. I get to nominate someone for next week’s Athlete’s Plate, and I have someone in mind that I think Jason will enjoy making a menu for. Thank you Jason, I can’t wait to make everything on the menu, it all looks so good!! OMG, finally, spring is in the air for you all. honestly, before the days of blogging, i could have cared less about the weather “up” there but NOW …i think about you all (like when it recently snowed AGAIN) and i feel bad and want to send at least 20 degrees of our warmth your way. And I really would share if that were possible. Can't wait to see the upcoming nomination for the menu. Figures TAAN & Team FIG are the first to respond. But let me guess….this guy Jason made the menu? LOL!!!! It is almost like my step-son who says my name 12391230483429050 times in 5 minutes…..LOL….I Love it. Glad you like the menu and you have me a tad jealous because I don't have a garden but need one. If I could fill up this pool and grow veggies and fruit I would be much much happier that is for sure. We're almost to spring as well – it's been a really cold and wet April, but at least minimal snow. Can't believe you can have a garden but no fence for rabbits or deer! did the flowers make you want to ride your bike? Just looking at those pics makes me want to go ride, like right now!!! yay for spring and flowers!!! cant wait to read your menu!!! Spring has sprung!! 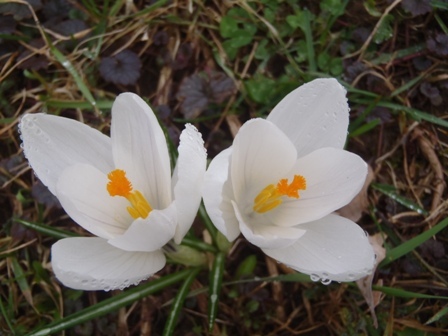 I love crocus! That must be a monumental event to see those flowers bloom. I am happy for you. But, you have not suffered enough through this winter. It is about time… we will be there soon!! Love the pics and a long winter makes spring even more special. That said, the older I get the more I can appreciate a short winter. Its been cool and rainy here. Not really feeling like spring but we might plant in the garden this weekend and I am going to my beekeeper friends house tomorrow to check some hives. howd you beat me to Spring?!? YAY for spring! It is about damn time. Yeah, so our soil is completely saturated. Can't even walk in our yard. No tilling the soil for another week or so. How the heck did YOU beat me to planting this year? WTF??? I am so happy that you are seeing some spring! The flowers are gorgeous! The flowers are very very beautiful. Spring is a wonderful season full of colors. I wish I had a green thumb….but mine is brown….. silk plants are lucky to stay alive in my house. Good thing Bill enjoys gardening…. b/c of him I fresh jalapenos, bell peppers, strawberries, basil, thyme and cilantro!!!! Off to take a look at the menu! I love gardening! I just wish I had more sunny land to do it. We had frost this morning and like you, more to come. Yay for your spring flowers! And, yay for being able to plant peas! I love to garden. This year though, since we're selling our house, I won't get to have my garden..boo! Plant some peas for me! Yay for Spring. I miss having an actual Spring. Here we go from Summer, to less Summer, and then back to Summer. Hooray Spring! I always think of crocuses as the official sign that Spring is here. ahhh spring, something we take for granted down here! (It's already in the 80's, blech!) Beautiful flowers! It's about freakin' time for the flowers to start growing! It's beginning to look pretty awesome in Michigan with the flowers, grass and leaves. Good luck with the garden.